While the decision wasnt unexpected, there are several things clients should know as rates rise, advisors say. Ever heard of three steps and a stumble? The Fed finally did it. It raised short-term interest rates for the first time in 9-1/2 years, ending a zero rate policy designed to combat the deepest recession since the Great Depression of the 1930s. The Fed raised its short-term federal funds rate from a range of 0%-0.25% to a range of 0.25%-0.50%. “The committee judges that there has been considerable improvement in labor market conditions this year, and it is reasonably confident that inflation will rise over the medium term to its 2 percent objective,” Fed policymakers explained in their statement released Wednesday afternoon. Peter Lazaroff, wealth advisor at Plancorp Financial Services in St. Louis, Missouri, views today’s rate hike as a positive development, indicating that the “economy is healthy enough” for the Fed to abandon its zero rate policy, and like many other financial advisors, he’s not making any changes to clients’ asset allocations in response to the move. Jon Ulin, a managing principal of Ulin & Co. Wealth Management, which is a branch office of LPL Financial in Boca Raton, Florida, says while he’s been telling clients “not to make any quick moves” with their investments based on the Fed’s move, now is “a great time for advisors and clients to review investment allocations.” They should be sure they are not overweight in any “long-duration” and/or “ultralow credit quality fixed income holdings, perpetual preferred stock investments and other sectors that could be affected over the next 12 months if long-term rates rise faster than expected,” says Ulin. Long-duration bonds are generally bonds with longer maturities. They lose more in principal than other bonds when long rates rise, but that may not happen for a while because inflation, a key trigger for long-term rates to rise, remains under control and because the Fed’s rate hike affects only short-term fed funds rate. Today’s Fed hike highlights another issue for investors and advisors: the divergence in monetary policy among global economies, which can create a “significant amount of volatility in the market,” says Bill Greiner, chief investment strategist at Mariner Holdings, the parent of Mariner Wealth Advisors, in Leawood, Kansas. Up until now, volatility in global markets has been concentrated largely in foreign currency markets, but that could spread into equity and bond markets as the Fed continues to tighten while the European Central Bank, Bank of Japan and other foreign central banks extend their easy monetary policies, says Greiner. He also expects the long-term bond market will eventually react as long-term rates rise eventually. “Don’t fight the Fed,” said Greiner. Initially, stock and bond markets hardly moved on the news, which was not unexpected, then stocks took off, with the Dow gaining more than 200 points, up almost 1.3%. Financial markets have been expecting the move for months because the U.S. economy has clearly recovered from recession. Growth is steady, the jobless rate is half of what it was, down to 5%, and the economy has more than made up for the almost 9 million jobs lost in the Great Recession. 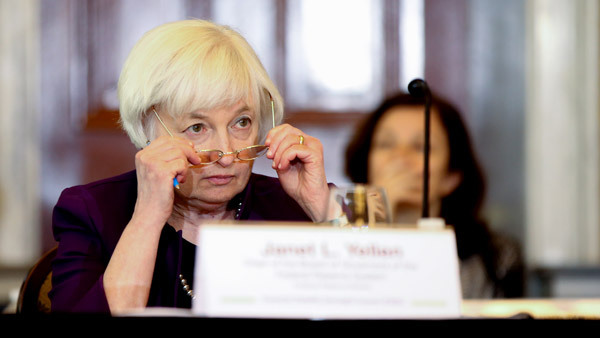 The Fed signaled that it expects its tightening moves will be gradual, as expected, but made no commitment to that effect, said Jim O’Sullivan, chief U.S. economist at High Frequency Economics.